​In what was dubbed 'The Perfect Match-Up' in the build-up to the nineteenth Super Bowl in Stanford, California, the nineteenth Super Bowl offered a plethora of reasons to look forward to the game. The San Francisco 49ers (15-1) and the Miami Dolphins (14-2) were clearly the best teams in the NFL. Each had romped their way the regular season, before dispatching their playoff opponents with relative ease. 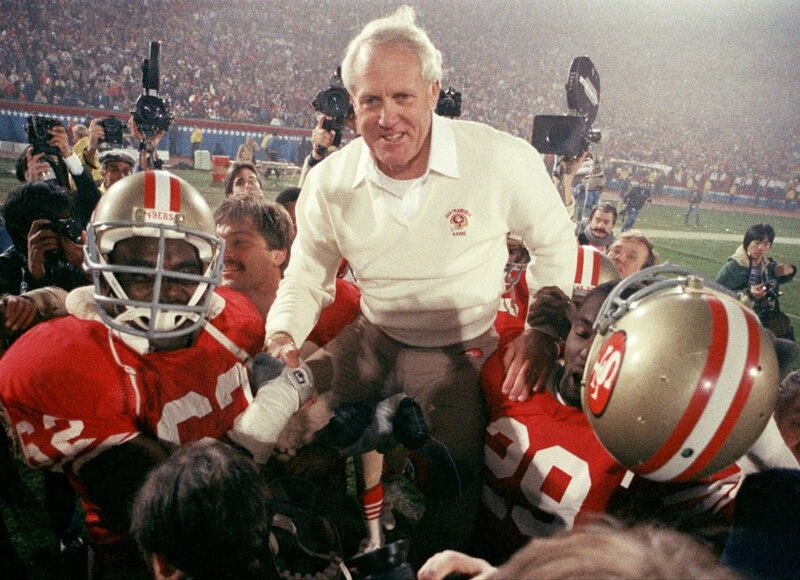 The Dolphins were led by the already legendary head coach, Don Shula, while the 49ers had the eccentric genius of Bill Walsh, a quirky head coach who already had a Super Bowl win in his back pocket. If that wasn't enough, the teams also boasted the two best quarterbacks in the league at that time, in the 49ers' Joe Montana and the Dolphins' second-year sensation, Dan Marino. However, Marino's fifteen minutes of Super Bowl fame proved to be exactly that. After a strong opening quarter that saw the Dolphins take a 10-7 lead into the second period, the 49ers took over, dominating on offense while their defense shut down Marino and Dolphins' usually lethal attack. 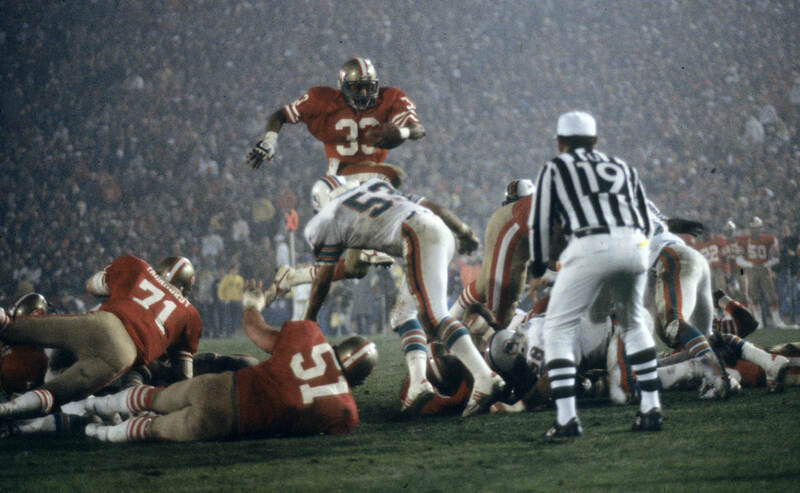 Two touchdowns from full back, Roger Craig, sandwiched between a Joe Montana touchdown scramble, had the score at 28-10 as the end of the first half neared. The Dolphins would add a pair of field goals before the intermission, but they would prove to be their final points of the contest. San Francisco would add a further ten points to their total before their defense finished out the showdown by smothering and stifling a frustrating day for Marino. 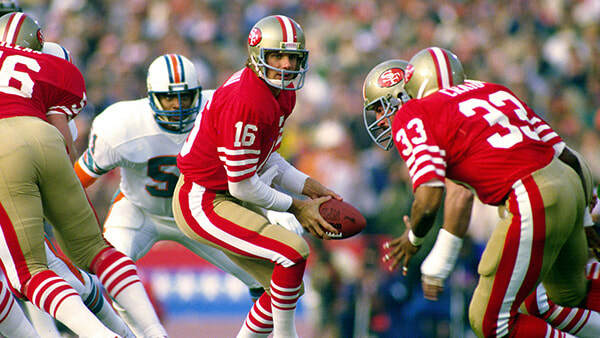 His counterpart, Joe Montana, would scoop his second MVP award as he threw for 331 yards and 3 touchdowns. 49ers' running back, Wendell Tyler, makes his way through the line against Miami. Halftime Show:"World Of Children's Dreams"
Super Bowl XIX was the game that made the NFL really take note of Roger Craig. 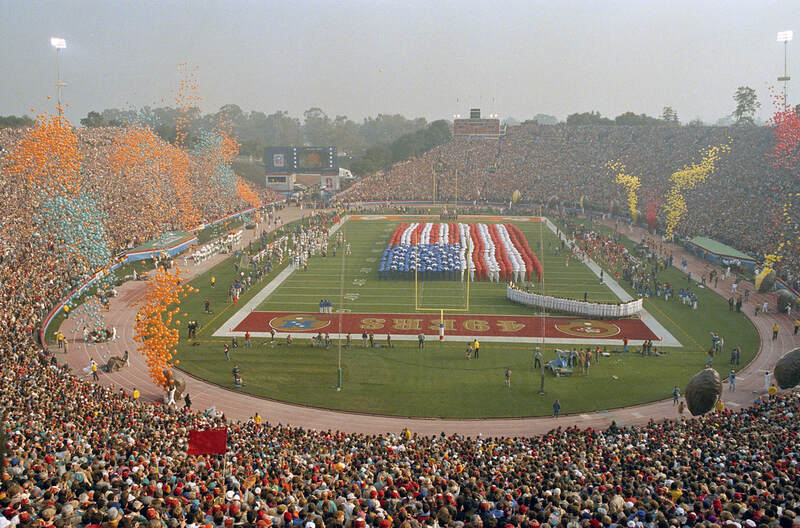 Super Bowl XIX was the first to be broadcast by ABC and their Monday Night Football announcing team. However, the infamous Howard Cossell missed the opportunity to be a part of a Super Bowl broadcast as his services were not retained by ABC following the 1983 campaign. 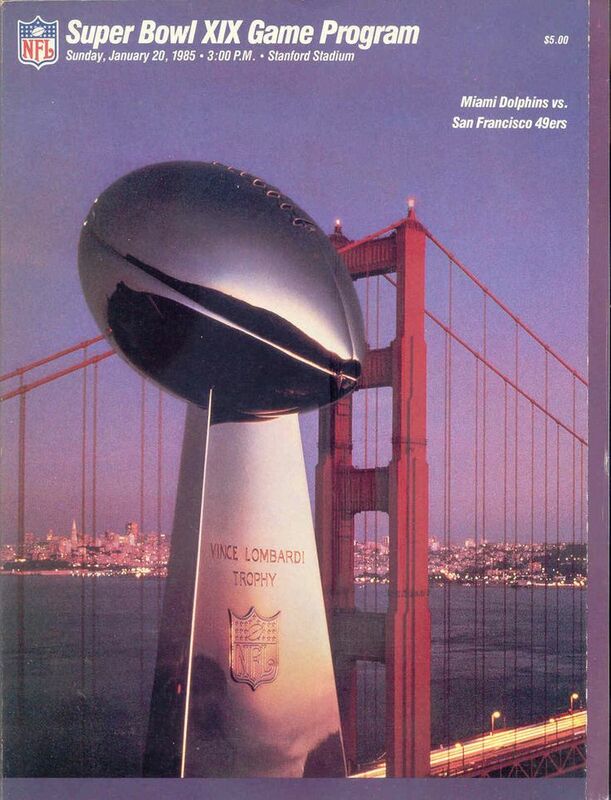 Super Bowl XIX featured the best combined records 29-3 (the 49ers were 15-1, the Dolphins were 14-2), and was dubbed "The Perfect Match". It was, to that point, the most anticipated Super Bowl match-up. Clips from NFL Films' version of the game were used in the 1994 movie, "Ace Ventura: Pet Detective", with the storyline following a fictional Miami Dolphins kicker - Ray Finkle - who "missed the kick in the Super Bowl" costing his team the win. 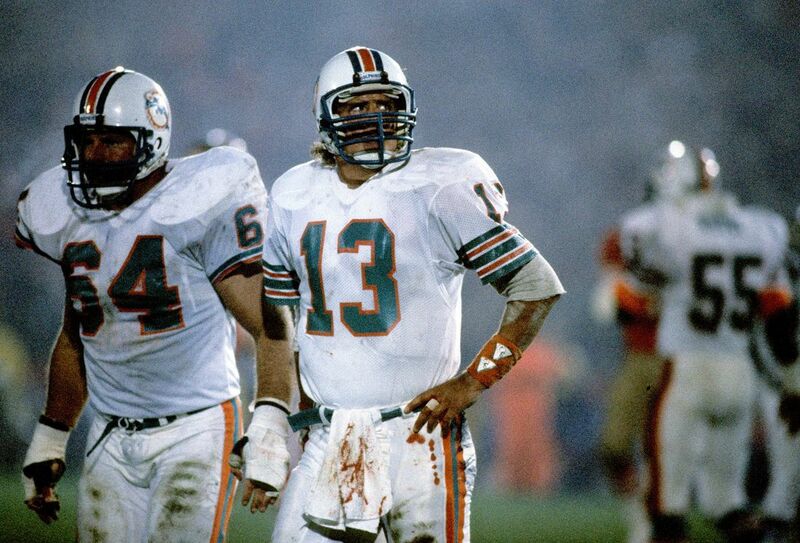 Although the Dolphins' actual kicker, Uwe von Schamann did have a terrible end to the regular season, he made all of his attempts in the Super Bowl. 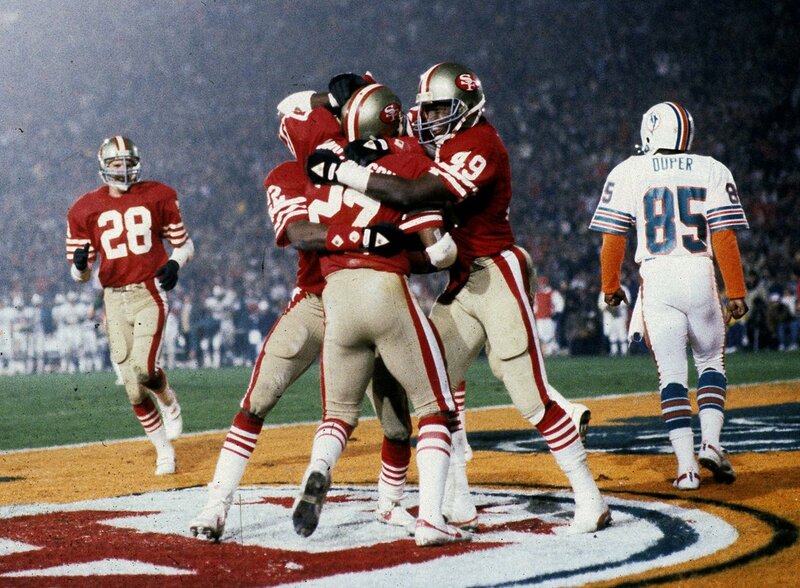 Super Bowl XIX was also the last Super Bowl to be preserved by NFL Films on "film". The following season, their productions began to use "videotape" instead.